pp. 239, soft cover, DKK: 248, - illstr., facsims., geographical and celestial maps, plans. Did Moses, one of the absolute main characters in the Hebrew Bible ever exist? Influential movements within modern branches of biblical research say no. Having compared the Moses narratives from the second to the fifth Books of the Pentateuch with archaeological excavations in Palestine, nobody has been able to scent out one single indisputable trace of the biblical titan. So it has been asserted. And according to the sceptical-methodological motto, lack of proof means proof of non-existence, and consequently that Moses is a mythical figure being staged because of religion-political circumstances, probably invented by a Jewish priesthood in the centuries prior to the beginning of our calendar. In other words, the impulsive basis of the appearance of three world religions, i.e. Judaism, Christianity, and Islam, has eventually created - well, a figment of the imagination. In short, this is what OvS states in his two books with the common headline "Assassinating Moses". Three additional books, also about Moses, are planned to be published within the next couple of years (all published 1999-2005, ed. note). In other words, something like a modern version of the five Books of Pentateuch. An outsider's decision on the above, mutually incompatible research results may be difficult. Then, how can the learned people be so disagreeing? Is Moses a literary fiction or an Egyptian crown prince of the 16th-15th century B.C.? What at all makes it defendable to spend time on OvS's highly spectacular statements is the fact, that nobody in Denmark either in history or at present has ever studied Moses, the phenomenon, as thoroughly as OvS. Also internationally, one has to look for a long time - a very long time - to find a researcher, who has written five books on Moses. More than anything, OvS deserves, thus, a lot of attention due to the voluminous scope of his research. In "The Suppressed Record", his first of these books, OvS starts out relevantly by explaining, why parts of modern research understand Moses as a mythical, traditional figure. He believes to be able to blame it on Karl Lepsius, the German Researcher, who approx. 150 years ago (1840ties) maintained that Moses and Ramses II were contemporaries in 1500. Later, however, Ramses II was proved to have been dated approx. 300 years too early. Nevertheless, the comprehension had been established that Moses had been living at the same time as Ramses II. So when the Egyptian Pharaoh was removed up till 1200 in the historical chronology, Moses was automatically and uncritically removed as well. This was to prove fatal. When research began seeking for Moses in that era - in reports from his times, or in archaeological excavations, and by ancient writers - Moses could not be found. The conclusion made by part of present researchers was obvious: Moses has never existed. According to OvS, he has been looked for in the wrong century. Very untraditionally, OvS points to Isaac Abrabanel (1437-1508), the Spanish Rabbi, who reports an old Jewish tradition about an astronomical event, a very rare grand conjunction in a certain aerea in the sky in 1537 B.C., a gathering of celestial bodies, understood as an astrological omen three years prior to the birth of Moses. This isolated tradition is not sensational, but it becomes so, when compared with modern, computer-based, astronomical dating, today considered the most reliable method of dating at all, thus also more reliable than C-14. Based on modern computation it appears that the said grand conjunction actually happened at a certain new moon in February/March 1537 B.C. And it is even to become more interesting. Based on the Hebrew, biblical description of Moses as "the son of pharaoh's daughter", OvS includes also rabbinical, Egyptian, Jewish, Greek, and Latin writers' information on Moses, and he makes geographical-historical reconstructions as well as linguistic and religion-phenomenology analyses. These he compares with Egyptian inscriptions of 1500-1400. As being pulled towards a black hole in the Universe, the widespread information gravitates towards the well-documented crownprincess Hatshepsut, who probably lived in the second part of 1500 and the beginning of 1400. She was the woman who on February 8, 1534 B.C. gave birth to a son, a situation that OvS establishes based on an ocean of indications. Because of his richly facetted abilities and great enterprises this son achieved a brilliant fame and appeared as the heir to the throne. At the age of 40, however, he is becoming the victim of a ritual of fake execution and is being exiled from the court as a result of fights for power, and this demolishes his name. And by this he disappears from official history writing. Hatshepsut's son, the son of pharaoh's daughter, was Moses himself - according to OvS. Of course the question is if OvS convincingly is able to make probable his spectacular thesis. In "The Enigmatic Son of Pharaoh's Daughter", OvS's second book of this series, he elaborates on his argumentation. With the accuracy of a treatise he chooses to focus on one single fact, i.e. Senmut, the Minister and Vizier of Hatshepsut. This man was unusual in every way. According to Egyptian sources, he is described as an outstanding architect and innovating builder, a successful head of the army - and foreign minister, finance minister, vizier, governor, Hatshepsut's deputy, etc, etc. And he was also famous for his great wisdom and initiation in esoteric matters. He possessed 20 of the most superior positions and bore more than 80 titles. In many matters he was very close to Hatshepsut. Senmut also had a mausoleum built, in which he installed a star map, moreover it is the hitherto oldest documented star map. On this is found a very rare grand conjunction, which has only taken place four times between 2200 B.C. and 200 A.D. - and among these: in 1534 B.C. With detailed reference to the Rabbinical Writings and ancient writers, OvS points to many direct or indirect similarities between Senmut - and Moses. For instance also that Senmut in 1494-1493 at the age of 40 years, suddenly had to escape from Egypt in dramatic circumstances, after which all traces of him disappear in Egyptian history. The conclusion by itself forces this appearance: Senmut was Moses. According to OvS it is unlikely that the many specific similarities should not point to one and same person. Such similarities cannot be found in any other circumstances in other periods of ancient history of the Middle East. Due to lack of necessary special scientific insight in the various circumstances included by OvS in his monumental synthesis, the writer of this article must emphasize of not being in a position to make an actual evaluation. However, what makes OvS's research interesting is his talent for finding new ways, focusing right new light on old circumstances/conditions, all in a time now often claiming - with unbecoming arrogance - to possess the firm answers. And by and large, nothing that happened 3-4000 years ago can we designate as being definitely sure of. This, of course, applies too for the OvS reconstructions. There is hardly any doubt that the Moses-image presented by the modern research has to be re-considered after OvS's books. It is much too vulgarized. It is based on a non-selection of a huge number of ancient information on Moses, or it is simply unfortunate lack of knowledge. The reason for this has often been the argument that ancient Jewish, Greek, and Latin writers' information on Moses are "legend based" and being from a era, which in any case is long time after that Moses perhaps, perhaps not, has existed. And this has been found "satisfactory" - which of course is also the easiest. But, as OvS so convincingly says, You don't escape it that easy. It IS striking that ancient literature has immense sources about Moses - often fitting like a glove concerning the conditions in Egypt in 1500-1400. It IS striking that today's astronomical dating confirms old traditions, even disturbingly precisely. It IS striking that no researchers have previously been attentive about these circumstances, which obviously deserves the attention of the broad public. Has modern research only for too long been sleeping the magic sleep? Do we have to re-evaluate dramatically our image of Moses and of sources, which for a long time have been ignored or neglected? The writer of this article is not going to participate in the conclusion. Truly, OvS dares one eye - the way a real researcher is supposed to do - unless he will be satisfied with being an bookkeeper. Also the research of OvS is based on a lot of uncertainties, not always on thoroughly documented statements, or on comparisons of fields of knowledge, separated today, which no modern researcher can comprehend in the light of the widespread specialising and hyper-specialising. Neither can OvS. A stated fact, however, is that OvS has thrown down an impressive, inter-disciplinary gauntlet, impossible to disregard. A gauntlet that the specialist researcher, the Egyptologist, the philologist, the researcher of the Old Testament, the religion historian, the Judaist, the astronomer, etc, ought to pick up and give an unprejudiced, specialist analysis. In his first book about Moses the writer argued that Moses was the son of Pharaoh's Daughter (a historical, well-documented title), and this new book sheds new light on new sides of Moses' dramatic role in Egypt and the Hebrew's history. Tuthmosis I created the new Greater Egypt, and Moses was brought up to later be pharaoh. In a coup Moses was removed as heir of the throne - hereafter he unsuccessfully tried to regain the throne - and eventually leading to the Hebrew immigrants to seek new country. The priesthood "removed" him as heir of the throne, his name disappeared from the records, statues, etc., he was made a scapegoat, and in the end a mock execution of him was carried through. The biblical Moses is compared all the way through with the descriptions provided by all other ancient writings, and by using a very broad research the author has managed to highlight new information about the historical Moses. For instance, he uses the data from the world's oldest star map (which is Egyptian). The author presents many clues, but more concrete evidence is still missing, and although it is his intention that the book should be read without any other condition than the mere interest, the number of detail and evidence is sometimes great that it can be difficult to keep the comprehensive view. 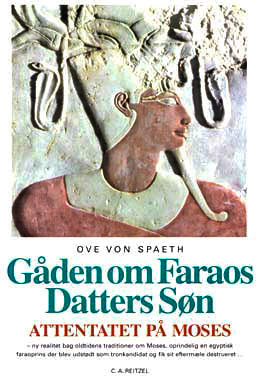 Spaeth, Ove von: "The Enigma of the Son of the Pharaoh's Daughter: - Moses' Identity and Mystery Reviewed". - C.A. Reitzel publishers, 2000 - 239 pages. - (Assassinating Moses; 2). - Library classification 91.21. This book is important! It is the volume two of Ove von Spaeth's five volume (life) work about Moses. As early as in the late 1970's and the early 1980's readers were able to get acquainted with Ove von Spaeth's epoch-making research (via a considerable collection of articles), which has now resulted in the publishing of the second volume of the series "Assassinating Moses". This is an exciting, provocative, and also incredibly well documented book trying to identify the identity and life of the true Moses through a considerable number of demonstrations. According to Ove von Spaeth's scientific research it is possible to prove that Moses was the son of the Egyptian princess (and later pharaoh), Hatshepsut - and therefore identical with Senmut, the Learned in astronomy and Egyptian Architect. In the book the life of Moses is described in details - almost like a reconstructed historic biography based on well documented and exploring research. By itself the description of the life of Moses and his importance for his time in Egyptian history is an exciting, scientific crime story. All known ingredients are present: secret children and marriages, fights for power, intrigues, assassinations, coups, and a secret execution. What is especially interesting to astronomy/astrology fans is the way in which Ove von Spaeth is using the astronomy/astrology for time determination of the oldest existing Egyptian star map. It contributes to that result that Moses was born much earlier than assumed so far. In appendix 2 of the book you can read one of Ove von Spaeth's scientific articles published in the highly estimated magazine, the "Centaurus International Magazine of the History of Mathematics, Science, and Technology" (Vol. 42/III, 2000). His paper in question describes in details how Senmut's star map was astronomically dated. Ove von Spaeth's statistical and astronomical arguments for dating the star map's depiction to the year 1534 B.C. is intriguing astronomic reading, and apparently the arguments are irrefutable. This very star map is among the material for determination of the merging of time of Moses and Senmut explaining the years of the lives of Moses/Senmut not available from the usual sources, and thanks to the cogent academic argumentation in favour of the theories of the book, entirely new and provocative ideas of ancient Egypt are brought about. As far as my information goes this book of the series - and the one preceding it - have caused a lot of turmoil within scientific circles. Previously Ove von Spaeth has caught attention in scientific circles as a learned in astronomy/astrology, e.g. in Peter Zeeberg's "Tycho Brahes Urania Titani - Et digt om Sophie Brahe ("The Urania Titani of Tycho Brahe - A Poem about Sophie Brahe"), Museum Tusculanum Publishers, from which the symbolic language of the poetry of Tycho Brahe made him able to determine the horoscopes of Sophie Brahe and Erik Lange. And "The Enigmatic Son of Pharaoh's Daughter" establishes the success of Ove von Spaeth. In this kind of review it is impossible to dig deep into all the academic questions no doubt being caused by this book, and I am not in a position professionally to evaluate the conclusions about ancient Egypt, but convincingly Ove von Spaeth's arguments and research are impeccable. The very comprehensive biography amounts to 40 pages! And the very fact that the first volume of the book created so much turmoil vouches for the quality of this important work. This book is hereby warmly recommended to everybody. The book is an exciting historical Egyptology crime story, and also a serious, scientific treatise with a rare depth and numerous interesting references to sources. At first I read the book as a crime novel about the search for the true identity of Moses, and that was an intriguing experience. This book has aroused my interest in a closer and deeper knowledge of this period of time. As a crime novel the book is easy to read, and after the reading the inclination is to start all over again and study the book as a scientific treatise, which is equally exciting. See more at the homepage: www.moses-egypt.net. Ove von Spaeth: "The Enigmatic Son of Pharaoh's Daughter". - Assassinating Moses, 2, C.A. Reitzel Publisher, 2000, 239 pages, illustrated, DKK 248.